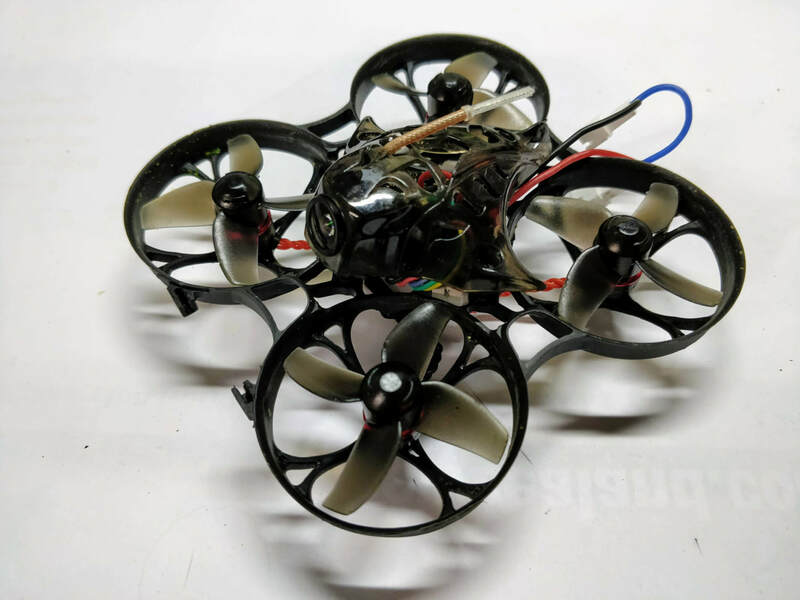 For those who wish to extract the most performance out of an aircraft EXEMPT from the new international regulations, there are many options using racing quadcopter motors, esc, and batteries. My fastest model uses a 350 mah EIGHT cell lipo that can sustain 20a+ or burst 40 amps. At half stick, it launches straight up. Turns 3.5x5" prop over 50k with over 4:1 thrust..
A new love came into my life today. She's fast, stable but squirrelly. Easy to feed and is fun at wee hours of fun in your living room while the rain pours down. First, let me start off by apologizing. There are actually three flight modes that can be set up with the SxR receivers. These are Quick Mode, Normal with Hover and Knife-Edge, and Delta-Wing V-Tail. For the purpose of this discussion, I’m only going to present my setup for Quick Mode as Normal and Delta V-Tail are a different discussion altogether. OK, now with the STK Tool showing in Device Manager and showing a Com Port. Go ahead and open up the SXR Config interface software, Picture 1. The Com Port will be listed on the bottom. If that is not the right Com Port, select it from the drop-down. Click on ‘Open’ and the software will read in the current settings of the SxR. Click on the Accelerometer Calibration Tab, Picture 2. There will be four sets of numbers in the X, Y, Z, and the ‘Mod’ boxes. The X,Y,Z are self-explanatory. At this moment the consensus has indicated the ‘Mod’ value represents, where Mike Blandford writes in the RCG forum, “I’m virtually certain it is the "Modulus" of the X, Y and Z values. These are the accelerations in the three, perpendicular directions. The modulus is the magnitude of the resultant vector when they are combined together, calculated using Pythagoras (square root of X squared +Y squared +Z squared)”. In other words, there is no mention of what “Mod” represents in the manual and no need to focus on that particular value. Now with ‘Mod’ explained back to focus. Received my BAMF from Armsoar. I weighed all the individual components before any assembly. Attached are photos and a spreadsheet detailing the starting weights. It’ll be interesting to compare to the final weight. Something is burning outside ..
A very nice hazy smokey eucalyptus morning .. I took the 480mm DIY Rc glider out for round 2 . Anyhow , it does glide .. ????? Why so bad on the hill ? At ground level it was really nice , but on the hill it just refused to move forward ..
Oh well ! it does glide .. But at 480mm , I would call it a waste of time .. Don't think its a worth while project ..
@ 600mm , such a RC conversion might be worth while .. The 480 still tip stalls , and is very jittery in the turns .. I'd simply call it too small to be practical . The wing is done .. So I pulled out another Rx and soldered the pins on .. This meant soldering plugs / connectors to the sub micro servos .. This means there is not enough room in the nose cone .. So I had to cut off some balsa that the Rx and battery attached to . Install the wing with CG as close as possible ..
First impression: The esc was well packed, in a very nice box. The esc is however bigger and heavier than the average 80A esc, hopefully it makes up for this with extra features. Connection: Connecting the esc to my phone was fairly simple. The wife from the module does sometimes take a while to show up,, but after you connect to the network, then hit connect in the app, everything works smoothly, and I had no connection issues. I don’t believe that the wifi module is included if you buy the esc, but I won’t complain too much since most manufacturers dont include any progrmming tool. App: The app is easy to use, and has a variety of settings, such as motor rotation, bec voltage, brake, etc. After connecting to the esc all of these settings are easy to change, and once saving the esc emits a series of beeps letting you know it has been updated. No issues here, everything worked as expected. Reverse: This esc allows you to switch the motor rotation in the app, or you can do so with a switch, provided yo have an extra channel on your receiver. This is not very common, but is very nice to have, and allows for some very weird but fun maneuvers. It is worth noting that this feature only works if you have the brake enabled. This is the test with the rpm glitch. If anyone is looking to upgrade to the V3 (trashcan) frame I can strongly recommend it, even if you do mount it backwards. It gives the strength I was always looking for in the frame without hurting the weight or flight performance. This step by step walkthrough was written to help newcomers or those less confident - no soldering, cutting, drilling etc., just bolt on an 5-20minutes. I'll be puclishing more articles shortly on bang for buck upgrades on the Mobula 7 to improve performance, range, efficiency and battery life as well as durability. Splish Splash in the Rain! Here is Part 2 of the foamboard snow skimmer build progress. Almost complete and a little demonstration/explanation of differential thrust. Nowhere near done. Just mounted the servos. Trying to figure out the best location for the rx. Some video from today... my first time using the FIREFLY.